A local artist will instruct you step by step through an original piece of art! At the end of the night you’ll take home a one-of-a-kind painting and hopefully a newfound talent! 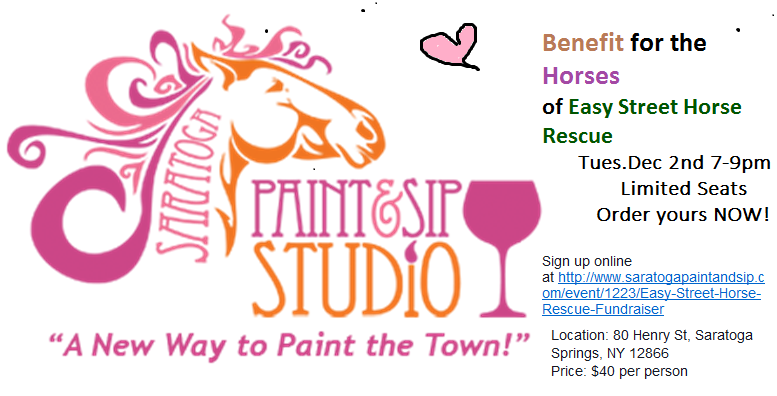 Pictures are from last year’s Benefit for Easy Street Horse Rescue at Saratoga Paint and Sip. They had a GREAT time. Space is very limited, so sign up NOW! Enjoy a FUN evening, PLUS help the horses??!!! Join us for the 2nd Annual Paint & Sip in Saratoga. IMPORTANT: Tickets are very limited and must be paid for in advance to reserve your seat. Please purchase online directly from Saratoga Paint & Sip. Or call them. Link and phone number noted below.